This paper first gives an overview of the epidemiological data concerning the cancer-preventive effect of brassica vegetables, including cabbages, kale, broccoli, Brussels sprouts, and cauliflower. A protective effect of brassicas against cancer may be plausible due to their relatively high content of glucosinolates. Certain hydrolysis products of glucosinolates have shown anticarcinogenic properties. The results of six cohort studies and 74 case-control studies on the association between brassica consumption and cancer risk are summarized. The cohort studies showed inverse associations between the consumption of brassica’s and risk of lung cancer, stomach cancer, all cancers taken together. Of the case-control studies 64% showed an inverse association between consumption of one or more brassica vegetables and risk of cancer at various sites. Although the measured effects might have been distorted by various types of bias, it is concluded that a high consumption of brassica vegetables is associated with a decreased risk of cancer. This association appears to be most consistent for lung, stomach, colon and rectal cancer, and least consistent for prostatic, endometrial and ovarian cancer. It is not yet possible to resolve whether associations are to be attributed to brassica vegetables per se or to vegetables in general. Further epidemiological research should separate the anticarcinogenic effect of brassica vegetables from the effect of vegetables in general. 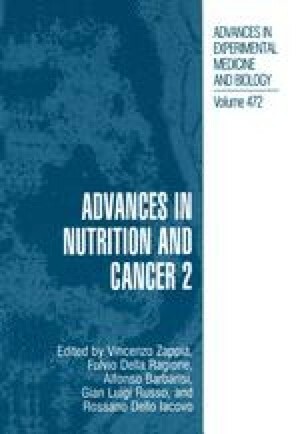 The mechanisms by which brassica vegetables might decrease the risk of cancer are reviewed in the second part of this paper. Brassicas, including all types of cabbages, broccoli, cauliflower, and Brussels sprouts, may be protective against cancer due to their glucosinolate content. Glucosinolates are usually broken down through hydrolysis catalysed by myrosinase, an enzyme that is released from damaged plant cells. Some of the hydrolysis products, viz. indoles, and isothiocyanates, are able to influence phase 1 and phase 2 biotransformation enzyme activities, thereby possibly influencing several processes related to chemical carcinogenesis, e.g. the metabolism, DNA-binding, and mutagenic activity of promutagens. Most evidence concerning anticarcinogenic effects of glucosinolate hydrolysis products and brassica vegetables has come from studies in animals. In addition, studies carried out in humans using high but still realistic human consumption levels of indoles and brassica vegetables have shown putative positive effects on health. The combination of epidemiological and experimental data provide suggestive evidence for a cancer preventive effect of a high intake of brassica vegetables.